My Giving Spirit is a line of gift products seen in one of Oklahoma City's main retailers, Hobby Lobby. This is a hand drawn logo. Perfect Pitch logo design. The logo design is one line that is the letter "P" and reminiscent of a musical note. We developed Vornado's Brand Promise, a new strategic brand identity and retail packaging identity that changed Vornado's future. The solution came in radical simplicity and a revolutionary anti-branding information architecture. We even re-named all of Vornado's products the same name for each product category and developed a new universal tagline for each product category. Crazy simple. Insanely simple. All the air circulator products are now called 'Whole Room Air Circulator" which is the brands "unique relevant benefit". This also allowed us to position Vornado and the original--leaving the competition to imitator status. Plus, we made the package design communication ultra clear by fully explaining what an air circulator is and what it means relative to a fan with the tagline, The tagline reads, "The fan that circulates all the air." Now Vornado's brand and brand packaging is differentiated from competitors and clearly positions Vornado as the definitive category leader and innovator. It's so simple and so clear it dominates the retail shelf. Until this new brand packaging Vornado failed for years to gain space on Target's lucrative retail shelves. With this new packaging, they not only got on the shelves but, according to Mark Zarich Director of Sales at Vornado the buyer actually said, "The packaging was the best in category." The brand packaging is selling so well Vornado has doubled their SKU's. The package is built as a sequential graphic design structure with each panel leading to the other building one concept on the previous. The graphic blue strip on the front right edge with the cut out arrow encourages turning the package to the blue panel which explains how Vornado circulates all the air. The graphic green strip with the cut out arrow on the blue panel encourages turning the package to the green panel which explains how whole room air circulation saves energy and money and makes a room more comfortable. The graphic black strip with the cut out arrow on the green panel encourages turning the package to the black panel which list benefits. The front panel states and explains Vornado's "unique relevant benefit" while all the other panels support that assertion. It was all developed out of the 'Brand Promise" and that's what we mean when we say strategic graphic design. What we developed with and for Vornado was, "Intelligent. Superior engineering. Innovation". From this we created the new brand packaging identity which Target said was the best packaging in the category and it got Vornado on Target shelves for the first time in their long history. Relatively the same products just different brand strategy and packaging. We didn't just say they were "Intelligent. Superior engineering. Innovation" but we designed an intelligent and innovative package and branding that showed superior engineering. The contextual approach, brand strategy, logo and graphic design embody the brand promise. Insight Design Communications is a breakthrough brand design studio with extensive experience in brand packaging. Client: Vornado. Work: Logo Design, Brand Promise, Brand Strategy and Architecture, Brand Guide or Corporate Identity Brand Manual, Brand Packaging for all categories; Wholeroom Air Circulator, Wholeroom Heaters, Wholeroom Humidifiers, Wholeroom Personal Air Circulators or Fans and Wholeroom Air Purifiers. Brand Product Brochure and Brand Story Brochure and Vornado Trade Show Graphic Design. This logo design and brand identity will be visible throughout the United States and in cities like Kansas City, Kansas, Wichita, Kansas, Dallas, Texas, Oklahoma City, Oklahoma, Denver, Colorado, New York, New York, Los Angeles, California, and Europe and Asia. We didn't just say they were "Intelligent. Superior engineering. Innovation" but we designed an intelligent and innovative package that showed superior engineering. We even re-named the products and came up with the new tagline. All the products are called 'Whole Room Air Circulator" which is their "unique relevant benefit". But what does that mean to the average consumer? The tagline "The fan that circulates all the air." explains it in one line. The package is designed sequentially, each panel leading to the other. The graphic blue strip on the front right edge with the cut out arrow encourages turning the package to the blue panel which explains how Vornado circulates all the air. The graphic green strip with the cut out arrow on the blue panel encourages turning the package to the green panel which explains how whole room air circulation saves energy and money and makes a room more comfortable. The graphic black strip with the cut out arrow on the green panel encourages turning the package to the black panel which list benefits. The front panel states and explains Vornado's "unique relevant benefit" while all the other panels support that assertion. It was all developed out of the 'Brand Promise". Carlos O’Kelly’s Mexican Café event logo for an in-store Mexican Fiesta promotion. The type is created to appear as a mosaic. Logo design Des Moines, Omaha, Wichita, Topeka and more. Design Source Interiors by Nahib Holmes is a retail store that also offers professional interior design services. World Import Gallery is a retail home furnishings and home accessories store that sells items from around the world. With A Twist is a specialty food and gift store. 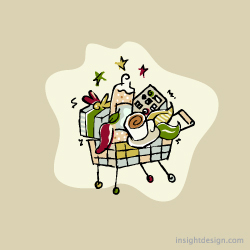 The logo is a shopping cart full of unique items consumers find in the store. Carlos O’Kelly’s Mexican Café margarita promotional logo that shows two maracas that are also margaritas. The logo is a party, music, drink and fun which are part of the brand position.